Preventing damage to containers during shipping is one of the biggest challenges for many manufacturers. Until recently, many companies spent a fortune on Styrofoam packing, specialized cardboard boxes and other costly shipping supplies to prevent their products from harm during the jostling and bumpy trip to their final destination. In the past decade or so, air cushioning has become the hot new way to protect products during shipping. Deflated air pillows can be easily slipped between pallets and containers, then quickly inflated to just the right size so they provide a snug, protective cushion that can absorb impact and protect products. Up until now, the biggest downside to using air cushions has been the clutter on the loading dock and other areas created by dragging the hoses and compressors used to inflate the air pillows. 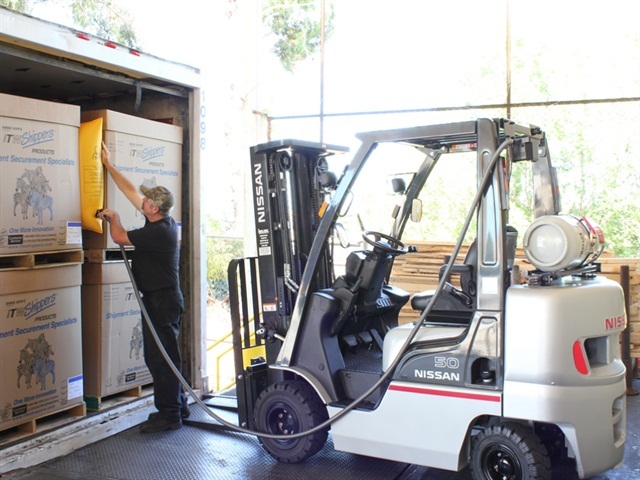 But now there is an innovative new forklift attachment that reduces clutter, speeds up efficiency and reduces the amount of time it takes to prepare packaging for shipment. The Forklift Inflator is a new attachment that from Shippers Products that attachesto a forklift and provides a portable way to inflate dunnage airbgs when loading a trailer with cargo. The Forklift Inflator replaces free-standing or portable air hoses and compressors. There are no air lines or air carts required. Plus, the Forklift Inflator runs off the vehicles’ battery, so it doesn’t even need to be recharged. The Forklift Inflator comes with a 15-foot air hose and bracket for storage, as well as a universal attachment for securing to the forklift. It works with all ITW Shippers lightweight airbags, as well as other dunnage airbag systems. The entire unit weights just 7.5 pounds. It has a maximum pressure of 1.5 PSI and comes with a one-year limited warranty, according to the website Trucking Info. The Forklift Inflator can significantly decrease loading time. It’s biggest benefit is its mobility. Now you don’t have to drag long air lines across the loading dock or continually connect and disconnect inflators. It requires no air lines and no compressors to function. With the Forklift Inflator,you literally just flip a switch and you can fill dunnage airbags anytime and anywhere in just seconds. Installation of the Forklift Inflator attachment is easy. You just use the quick attach bracket and hardware, then install the power cord to the forklift’s existing 12-volt power supply. The lead from unit connects to the positive terminal of the battery. To use the Forklift Inflator, you simply remove the inflation head from the securement and uncoil the inflation hose. Then you flip on the on/off switch, open the air bag valve cap and insert the inflation head into the air bag valve opening. You need to place the air bag in the void between packages at least one inch above the floor in order to prevent friction during transit. Plus, no part of the air bag should stick out beyond the edge of the load. Then you simply fill up the air bag, securing the load. Once the optimal air bag inflation pressure has been reached, you remove the inflation head from the valve, secure the valve cap, and turn the Forklift Inflator off.